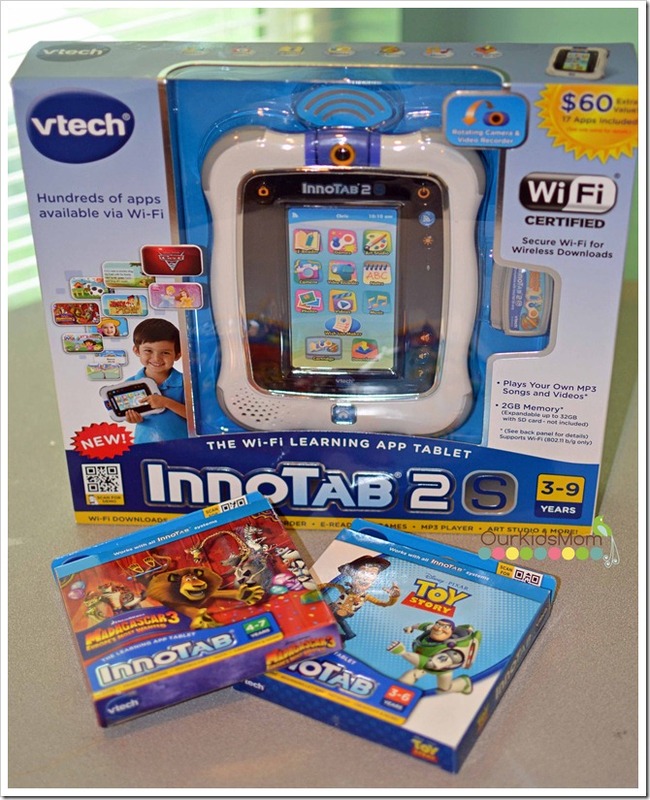 VTech product, information, and additional gift pack for giveaway have all been provided by VTech. 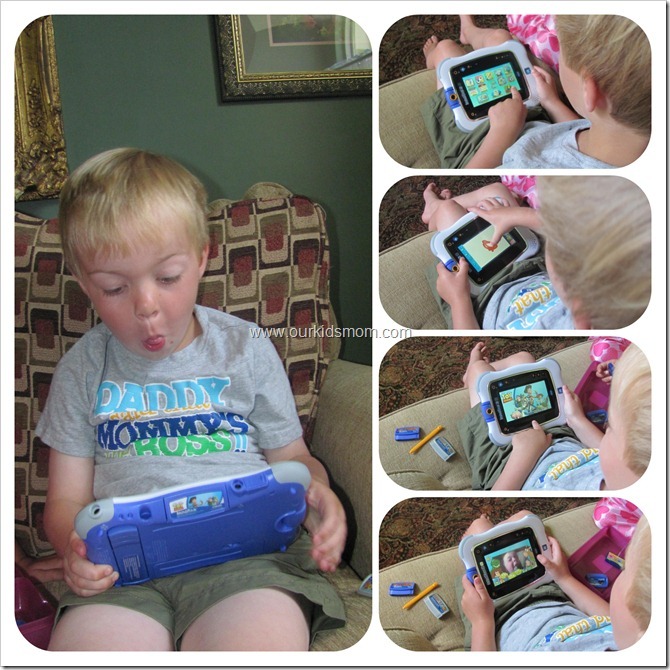 September of 2012 Emma and Ethan reviewed the Vtech Innotab. Since then, the Innotab has been Ethan’s “go-to” toy when it’s time to grab something to keep him occupied outside of the home. When we were offered the opportunity to review the Innotab 2S I was intrigued. One of my frustrations with any of my children’s learning games is that I have to dig out the corresponding computer cord, dock it to my computer and sift through/download all while attached to my computer. The Vtech Innotab 2S Wi-Fi Learning App tablet is one of the first children’s learning based tablets with Wi-Fi. Being able to connect wirelessly to Vtech’s app store, the Learning Lodge, makes life just a little easier. Now while we are snuggling on the couch we can connect, browse, create wish lists and download content. The InnoTab 2S is a child’s own tablet that opens up a world of age-appropriate content across the widest variety of curriculums, from downloads to software cartridges, the InnoTab 2S combines innovative technology with a developmental learning tool that grows with a child and makes learning fun. 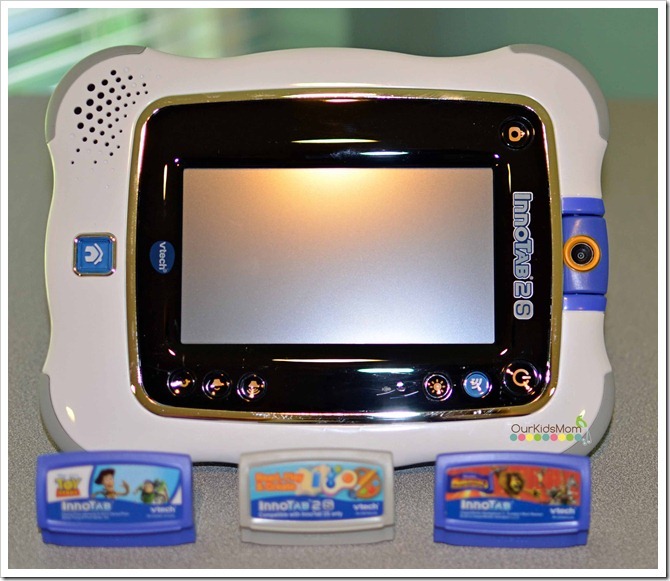 The InnoTab wirelessly connects to VTech’s comprehensive app store, the Learning Lodge™, where parents and children can easily browse a variety of content, and children can create a wish list and send to their parents’ e-mail. This sleek and durable toy comes equipped with 180° rotating camera and video recorder, tilt sensor, photo viewer, video player, MP3 music player, e-reader, art studio, microphone and more. I am all about keeping things simple, so having the option of downloading content from the Learning Lodge is a huge plus for me. My kids have the ability to lose a game cartridge in 10 seconds flat. Now they can still have games with their favorite characters, show themes, subjects and activities all at their fingertips. Once again the Vtech Innotab 2S was a huge hit. With just the basic platform Ethan can entertain himself for hours. The still and video cameras provides hours of humorous play and the MP3 player allows him to listen to his favorite songs without having to snag Mom’s iPod. The learning cartridges add a while new dimension of play. I love that while he is having so much fun, he is learning things like math skills, reading skills, social skills and creativity. He can continue learning through the summer and prevent “summer brain drain”Ethan’s requests for my iPad have decreased tremendously since the Vtech Innotab 2S has entered our lives which makes me one happy Mommy. Disclosure of Material Connection: I received one or more of the products or services mentioned above for free in the hope that I would mention it on my blog. I only recommend products or services I use personally and believe will be good for my readers. 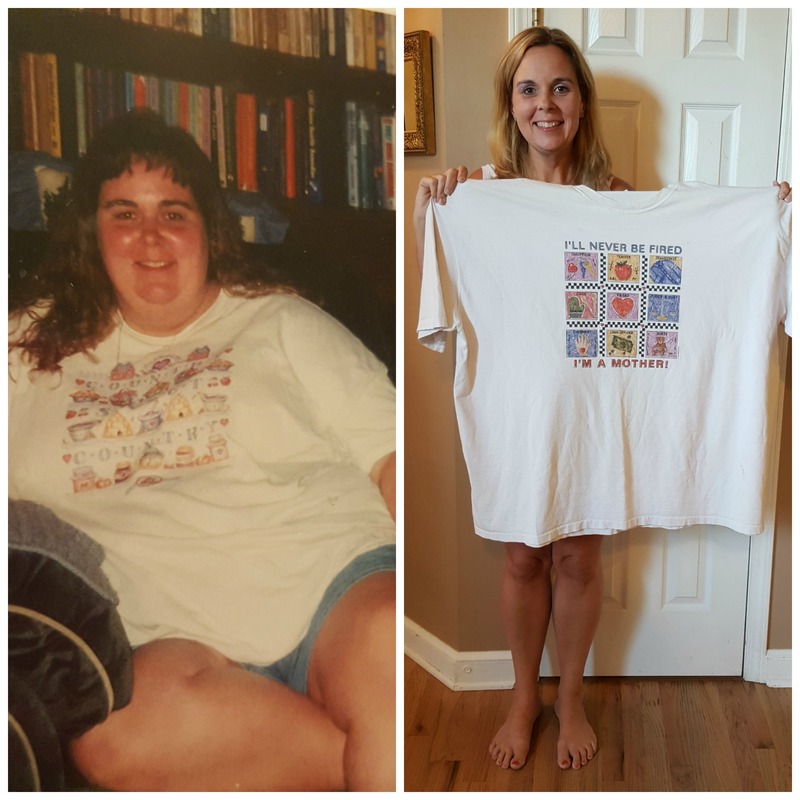 I am disclosing this in accordance with the Federal Trade Commission’s 16 CFR, Part 255: “Guides Concerning the Use of Endorsements and Testimonials in Advertising.” The opinions expressed in this post are entirely my own. Your experience with the product may differ from mine. The sponsor is responsible for prize fulfillment and will be shipping the winner(s) their prize(s). This post may contain affiliate links. For more information read my disclosure policy. We like the Catch Me Kitty and want it! The little Cogsley looks so cute for the younger kids! My daughter loves the Disney’s Minnie Mouse cartridge! Another fantastic item is the MobiGo 2, my sons would love it. I love the variety of cartridges. My boys love Team Umizoomi, Jake, Mickey, etc. What I learned. Vtech makes an array of learning toys. I can’t get over the collection of Kidiminiz. Wow! There’s quite a few. I like the MobiGo 2! my nephew would love the Cars 2 game. i would like the Touch & Teach Turtle. i love that they help our kids toys!!! My son wants Cogsley the robot. they have a minnie mouse game! I’d also love Cogsley for my kids! I love how this would help my kids learn in the summer. My daughter would like the Brilliant Creations Advanced Notebook. My daughter loves playing learning games on our Ipad/Iphones and she would love to be able to have her own with her own games and all! Also love the Alphabet Activity Cube! I would love to have a Kidizoom Camera for my little one! I like the Switch & Go Dinos! The video camera feature would keep my son entertained for a long time! I also like the Brilliant Creations Color Touch Tablet. I like the Stencil & Learn Studio – my kids, even the older ones, all love the doodle pro we have but I love that this one has more that comes with it! I like that they have something for every age starting at birth. The idea of Vtech University is great. That Alphabet Activity Cube looks fun! Aside from the tablet that I’ve been wanting to get for my son I like the MobiGo.. maybe then he’d stop stealin my cellphone and playing with the texting keyboard! I like the Brilliant Creations Advanced Notebook. I like the Cogsley with ABC Text & Go. I like the Alphabet Activity Cube. I like all the great games they have that the kid’s can play. I’d love the Cars game to go with the Inno Tab 2. My son would really like it. My kids would love the Sponge Bob game! Great way to use the InnoTab for older kids! My five year old would love the Toy Story Game. LOVE THE DOWNLOADABLE GAMES ! I would like to get my daughter the Vtech MobiGo 2. I love all the apps. 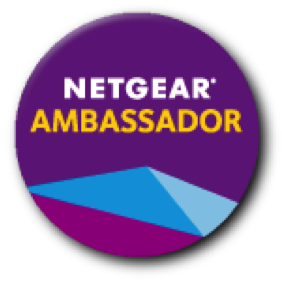 that are offered on the Wi-Fi on InnoTab® 2S. I love that the games are fun, yet still educational! I also like the Slide and Talk Smart Phone. I love how they take games that are of interest to kids and make them educational! My grandson would like the Switch & Go Dinos! My granddaughters were adopted young but were meth babies. Their learning was slowed down because of it. I think the Innotab would be something that could help them get caught up. Another product I like is the Kidizoom Camera- Pink 🙂 So much fun stuff! The kids would love the InnoTab 2 Travel Set – thank you. I also like the MobiGo 2. My girls would also like Cogsley. I want the Cogsley robot toy! I would like to have the MobiGo2 for my kids. I like the variety of cartridges that there are for the Innotab. I think the Tote & trace drawing board is really clever. I learned that here is a VTech University. My daughter would love the InnoTab Software – Disney Fairies! I think my daughter would love the 3-in-1 Musical Band! I like the hello kitty cartridge.. The switch and go dinos are pretty cool! My daughter would love the Team Umizoomi game, she loves the show. Milli is her fave! I like the Disney Fairies game. I think the Cogsley with Scroll & Learn Camera looks like lots of fun. My boys would love that. My son would love Cogsley! I like the selection of games they have! I like the tote and trace drawing board, I think it would be great for my daughter to use on trips. We also like the MobiGo2! I like the Bouncing Colors Turtle for my grandson. I really like the Innotab Travel System. 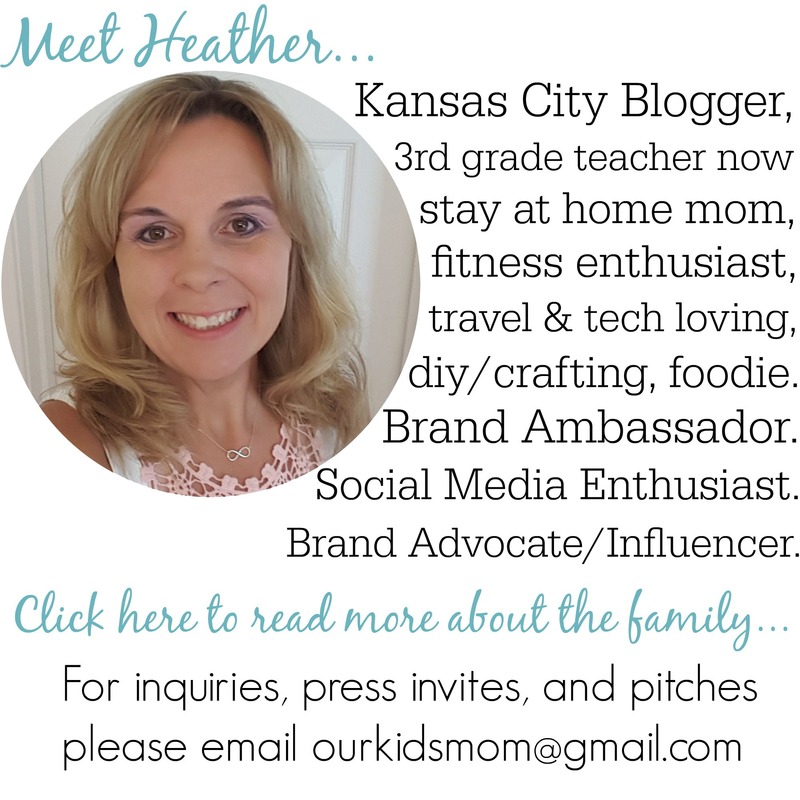 I also like the MobieGo 2, my kiddos would love it! I like the orange Kidizoom Camera. I know my 4 year old would LOVE the toy story game! I would also love the InnoTab 2S Travel Gift Set Pink times 2 for each of my girls. My son would love the Jake and the Neverland Pirates and Thomas & Friends cartridges to go with the innotab! My daughter would love all the different Apps to choose from! And of course the Disney Princess game. Id like The MoBiGo 2!! I think my son would enjoy the toy story game. The love the Brilliant Creations Advanced Notebook looks good! I like how interactive the toys are. I like the Mobigo 2 too! the mobigo 2 looks good too! The Switch and Go Dinos look like fun!! My son would like the Jake and the Neverland pirates game.I really like the vtech e-reader as well. The MobiGo 2 is nice too. I like that the tablet has a camera. I want the Catch Me Kitty, so cute!!! I love the Preschool Musical Gift Set! I like that they have a newsletter that you can get updates. I love the Nesting Animals! I want the Toy Story game cartridge to go with the Innotab 2S. I also like the Brilliant Creations Advanced Notebook. I think my nephew would have a blast playing with a meet the dino. My son would love the Spongebob Square Pants game for this! I think he would also love the drawing board, so cool! I like the alaphabet actitivy tube. I like the tote and trace drawing board. Love the Tote and Trace Drawing Board! I like the Move & Crawl Ball. Alphabet Activity Cube With Bonus Blocks Set – Online Exclusive. The tot n trace drawing board looks neat! My son would also love Cogsley the robot! I liked all the cartridges! Lots of great lessons like spanish.